The Lee Bros. « Stitch Design Co. The Lee Bros. came to Stitch several months ago to design this logo which appears on their new line of kitchen ware. The Lee’s line ranges from a 12-piece canning kit to a 19-quart steamer pot with pigot. 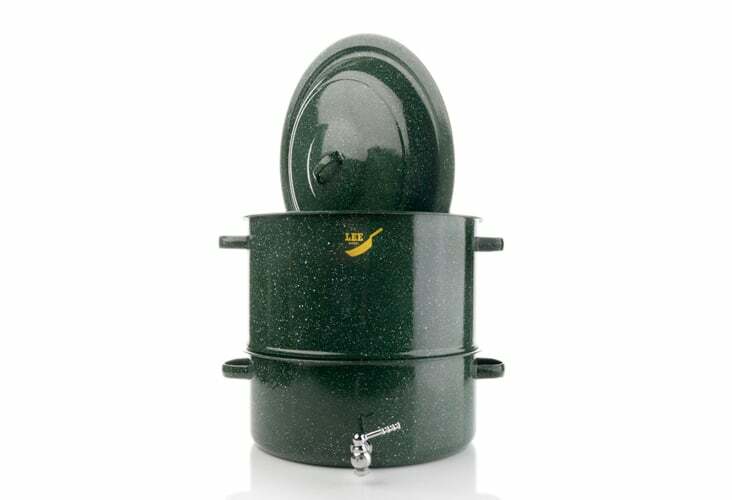 The new line is manufactured by Graniteware in Terre Haute, Ind., and is the last enamel-on-steel factory in the continental United States. The new line will debut this weekend during an HSN tv event presented by Bon Appetit. Segments will air at 3 a.m., 10 a.m. and 2 p.m. Sunday. Congratulations Matt and Ted! We love your new vintage inspired pieces. Comments Closed Tags: Logo Design, Matt and Ted Lee, Stitch Design Co., The Lee Bros.